Простая и чистая WordPress тема от ThemeForest, характеризуется галереей изображений из перекрывающихся листов. Страница для галереи, для блога, архива, контактной формы, основная страница контента, карта сайта. 2 типа галереи. Каждая из галерей предлагает свои эффекты, также в одну из них бесплатно интегрирован эффект Lightbox. Вы можете с лёгкостью менять размеры ваших столбцов. Sheets is a very simple, clean theme characterized by a homepage image gallery made up of overlapping sheets. Like pages of a magazine or catalog, visitors can flip through each slide, but with the click of a button. Adding large, compelling photos to the gallery makes changing the look of the Web site quite simple. As your topics or products change with the seasons, the appearance of your site will too. 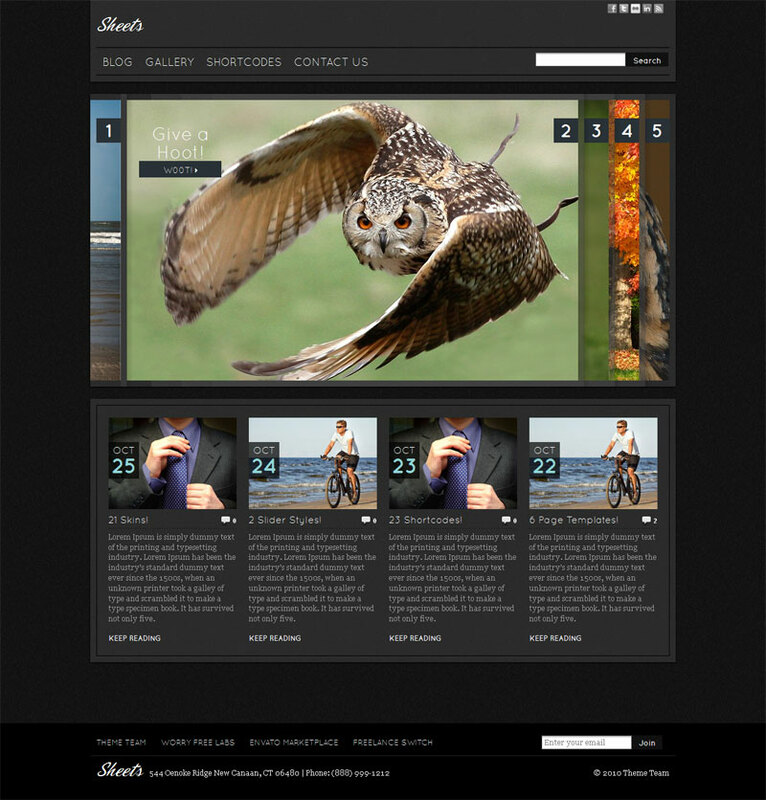 A second homepage gallery option offers a different layout: a large image slider and featured posts beside it. Choosing one of the theme’s ten different color schemes will also change the look of your site. The Gallery template offers two types of galleries: Galleria and FancyBox. Both galleries offer different effects, and the FancyBox gallery includes free Lightbox gallery integration. As you add text to your site, you can try different layouts by changing the size of the columns. Sheets makes this an easy task by providing shortcodes for five different column widths. Finally, Sheets includes detailed documentation to help you quickly set up your Web site in WordPress. Includes layered Photoshop PSD (Photoshop) file of entire site. On this site you can download premium wordpress themes and free premium wordpress themes.